On the southern bank of London's river Thames, between St. Saviour's Church and Southwark Bridge Road, with its principal entrance in Park Street, was the renowned Anchor Brewery, which has held a reputation for strong ale from very early times. 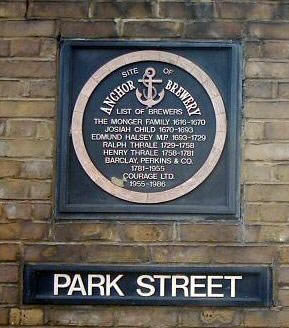 The Anchor Brewery no longer exists, but the Anchor Public House stand on the same site at 34 Park Street, Southwark, London SE1 9DN. This on the south bank of the river Thames, near London Bridge and Shakespeare's original Globe Theatre. It is about 250 metres north of Thrale Street. The Globe which was built in 1599 by actors Richard and Cuthbert Burbage was burnt down during a production of Henry VIII in 1613, three years before Shakespeare's death. The playhouse was rebuilt by July of the following year but like all other theatres, it was closed down by the Puritans in 1642, and it was destroyed in 1644 to make room for tenements having not reached its previous popularity and was demolished in 1644. On the 28th December 1598, actors Cuthbert and Richard Burbage, fearing that the landlord would seize their theatre at Shoreditch, forestalled him by pulling down the building and transporting the materials to the south side of the Thames. A site had been acquired on Bankside and on it, in 1599, the Globe was erected. Fourteen years later, in 1613, the thatched roof of the playhouse caught alight, as a result of the firing of cannon during a performance of Henry VIII, and in a short time the building was burned to the ground. The new building, erected in the following year, never attained the success of its predecessor and, on the expiration of the lease in 1644, was pulled down. The site became covered with buildings and, in 1777, passed into the possession of Henry Thrale to become part of his brewhouse. I started work at Barclay Perkins on the 8 August 1949 and retired on the 30th April 1991, going through all the mergers and acquisitions. I started as a messenger on the Lodge as it was known in Park Street, I worked in the Surveyors department and was there during the fire in the Lager department. I worked at Park Street, Horselydown, Purley and Merton. I once worked at the brewery at the time Harp Lager was first produced (when passing the filling line there was always some tasters given by operators on the line), employed by a piping company installing pipework in the brewery and fondly remember that we had a free issue of 2 pints a day which was dispensed from the Tap room. In later years I had my own business and often used to visit the brewery to see my employees and would meet up with the Chief Engineer whose surname was LEACH. It was some time ago and I cannot remember all the details perhaps your memory is better than mine.